Take on the mutant zombies of our online zombie game where you have to protect the city from enemy attacks. Kill the zombies to get coins, you can redeem them at the gun shop to buy upgrades and buy new weapons. This fun game can be made from any device: Smartphone, tablet and PC. Dare and click on this exciting game trying to annihilate all the living dead before they do it with you. 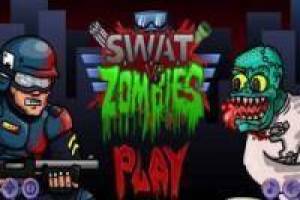 Enjoy the game Swat vs Zombies, it's free, it's one of our zombies games we've selected.